January and February are two months that we spend mostly working from home. During the rest of the year, we divide ourselves in between the studio kitchen and our smaller kitchen at home, bringing up and down the stairs cast iron pots, already photographed recipes that need only need to be reheated for dinner and bags of flour, giving proof of acrobatic skills with oranges and apples. Downstairs cooking classes, shooting days for clients and the blog; upstairs planning sessions, hours of writing and all that can be done with a notebook and a pen. In summer it is easy, our home takes deep breaths and expands to include the studio, the garden, the table under the olive trees, the vegetable patch. In winter we turn in, shrinking just like the space at home, we hole up in a few rooms, cutting down the excursions to the studio to the sporadic cooking classes. We heat both the home and the studio with a wood burning heater, so life is much simpler – especially for Tommaso, the fireman – when there is only one heater to handle. Our house becomes a cozy nest, every room comes back to life rediscovering its original purpose, the corners are lit with light, the heater becomes the centre of the house around which our routine revolves, the attic an alcove that attracts the warmth of the fire during the day and then gives it back during the night, while we’re abandoned in deep and safe sleep. There is only one problem in living on two different floors, in between two kitchens and with two different rhythms: the pantry. Open bags of grains, strange shapes of pasta used just for a single photo, sachets of baking powder, open packets of pulses, almond or hazelnut flours expiring: everything travels on two different tracks, up and down, either for home or for work. This is the main reason why we can not stick to a serious meal planning, and why there are days when we eat like during a Roman banquet and others when our meals live up to the standard of a Buddhist monk. When we hole up in our smaller kitchen upstairs, the remnants of grains, flours and pulses resurface implacably. Now I make a point of honour of being able to finish all that is open, limiting myself to buying just fresh ingredients, especially at the market and at the butcher. This is when I have finally time to browse through the pantry shelves to check the expiration dates and to rationalise the leftovers into glass jars, aligning them on the shelves to be used in the next weeks. I take pride in making a meal with little, putting together a handful of whole wheat pasta and some vegetables, or my beloved butternut squash and chickpea soup. Different grains become a risotto, made with barley or oats instead of rice. And then I notice a bag of farro, probably left from a summer salad, and I immediately think about a cake, a cake for an afternoon snack. I remember also that farro tart I tried in Garfagnana, with ricotta and chocolate, how moist it was, with a subtle hint of orange, thick enough to sink a fork in its filling with joy, encased in a crumbly short pastry. That’s how I could use that last remnant of farro. This farro tart reminds me of my mum’s favourite rice pudding cake, but it hides some surprises: a crumbly shell holds a creamy farro filling, softened by some fresh ricotta, to which I added the grated zest of an orange, to give it a citrusy hint, and a handful of chocolate chips. Yes, chocolate is always a good idea, especially when paired to orange. You can bake it as an afternoon snack, though it would be hard to resist a slice of this tart even for breakfast, or at the end of a family meal on a Sunday. Instead of chocolate, or along with it, you can add raisins soaked in dessert wine, or some candied orange peel. 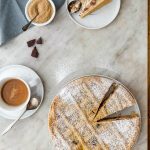 This farro and ricotta tart has a soft filling as the farro is simmered in milk and cream and later stirred into the ricotta. There’s a delicate orange hint and a handful of chocolate chips in the filling. Rub the butter, the farro flour and the sugar with your fingertips just until combined. Add the salt and the grated zest of an orange. You don’t want large lumps of butter remaining in the dough. Mix in the beaten egg. Try to work quickly so that it does not become greasy, press the dough together, wrap it in cling film and let sit in the fridge for a few hours or even overnight. Now prepare the tart filling. Cook the farro in hot boiling water according to the package instructions. When it is cooked al dente, drain it and transfer it into a saucepan with cream, sugar, salt and vanilla seeds. Cook over medium heat for about 25 minutes, stirring often, or until the farro has absorbed the milk and the cream. You don’t want the farro to be too dry, aim for a risotto texture, creamy and soft. Let it cool down completely. When the farro is cold, mix in the ricotta, the grated orange zest and the chocolate chips. When it’s time to finally bake your farro and ricotta tart, heat the oven to 180°C (350°F – gas mark 4). Remove the short crust pastry from the fridge, divide it in a half, then knead it until softened, then roll it out on a floured surface with a rolling pin in a 5 mm thick sheet. Keep the second half in the fridge until needed. Line a 24 cm round loose bottom baking pan with the short pastry. Spoon the farro and ricotta filling into the short crust shell, smooth it with a spatula and remove the excess dough. Use the other half of the dough to decorate the top of the tart. Bake the farro and ricotta tart for about 45 minutes, until set and golden. Allow it to cool down for a few hours before slicing and enjoining it. This is a cake I would bake week after week as a winter afternoon snack. But should I serve this as an after meal treat, what could I pair this farro and ricotta tart with? In these cold and snowy days, I feel like soups and stuffed seasonal vegetables, so we could start our dinner with a butternut squash and chickpea soup, though you can use instead beans or lentils, if you have to finish that almost empty bag of pulses sitting in the back of your pantry. As a main, I would bring to the table my grandma’s tuna and pecorino stuffed artichokes and Ada Boni’s unusual tuna and breadcrumb stuffed carrots. Chickpea and butternut squash soup. Last year I found myself with a bowl of cold chickpeas and some butternut squash which screamed to be used as soon as possible. They married in a thick soup tinted in autumnal colours and since then this has been my go to meal when I’m in a hurry and I need a comforting bowl of steaming soup to cheer up my day. Save a few tablespoons of chickpeas to spoon over the soup, they’ll add texture and a nice decorative touch. Serve it with toasted bread smeared in blue cheese and you can call it a meal. My grandma’s tuna and pecorino stuffed artichokes. These are my grandma’s tuna and pecorino stuffed artichokes, round chubby vegetables with a soft tasty filling that are cooked with water and olive oil. The result is a deep green olive oil which makes the artichokes shimmer, and is also so tasty that you will finish your bread mopping the olive oil directly from the pan. And you will also lick your fingers. With grandma we talked about ingredients, stories, variations and memories and we agreed that garlic and parsley are necessary for the taste, tuna has to be of good quality, breadcrumbs are better when home-made, you can’t be stingy with olive oil and grated pecorino. Wedges of potatoes must be abundant, soft on the inside, golden and crisp on the outside. Artichokes will be steamed by the water in the pan and later fried by the olive oil: this will produce a tender heart and crisp deep green leaves which will disappear like crisps. Ada Boni’s stuffed carrots. This recipe is an ode to the good housekeeping, to those women that are able to bring to the table a dish that fills the eyes and the belly with the few ingredients you can find in your kitchen on a Thursday morning (do you happen to go shopping on Friday afternoons and find your fridge crying in emptiness on Thursdays, right?). As for the bread mentioned in the recipe, you can use stale bread as well, do not throw anything away… remember, I belong to the Tuscan school! Compared to Ada Boni’s recipe I added two teaspoons of strong English mustard, which adds up to the plate a distinctive character. If you want something more delicate, just omit it. How do you use your leftover chocolate? 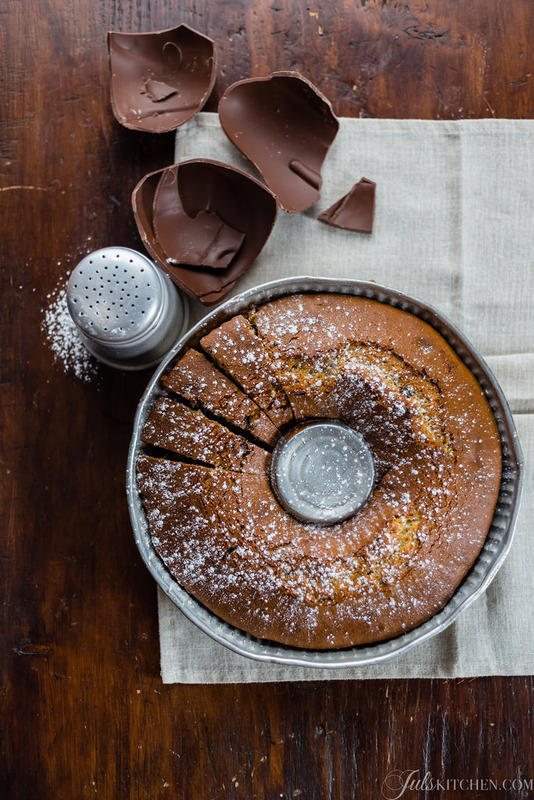 I made a Tuscan bundt cake Laura’s Sacher Torte Happiness is (sharing) a slice of chocolate cake Chocolate and semolina tart to celebrate Easter and a new book I’m working on! I have never seen a “farro flour” here in the US. Do you think a spelt, or regular whole wheat (or maybe whole wheat pastry—or, we have something called “white wheat” which is also a whole grain wheat flour) would be good? PS I love your butternut chickpea soup, it quickly joined our regular soup line up. Ciao Gabrielle! You can use a spelt flour, or even a regular whole wheat. Never tried the white wheat, but I am sure it would work as well!